American gamma ray astronomy satellite. Swift was a first-of-its-kind multi-wavelength observatory dedicated to the study of gamma-ray burst (GRB) science. 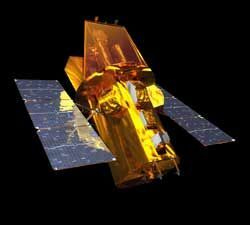 Astronomy, Gamma Rays satellite built by Spectrum Astro for NASA, USA. Launched 2004. Used the SA-200LL bus. AKA: SA-200LL. Status: Operational 2004. First Launch: 2004-11-20. Last Launch: 2004-11-20. Number: 1 . Gross mass: 1,331 kg (2,934 lb). Height: 1.16 m (3.80 ft). Diameter: 0.13 m (0.42 ft). Span: 0.31 m (1.00 ft). Its three instruments would work together to observe GRBs and afterglows in the gamma-ray, X-ray, ultraviolet, and optical wavebands. Determine the origin of gamma-ray bursts. Classify gamma-ray bursts and search for new types. Determine how the blast wave evolves and interacts with the surroundings. Use gamma-ray bursts to study the early universe. Perform the first sensitive hard X-ray survey of the sky. During its nominal 2-year mission, Swift was expected to observe more than 200 bursts with a sensitivity ~3 times fainter than the BATSE detector aboard the Compton Gamma-Ray Observatory. Swift's Burst Alert Telescope would detect and acquire high-precision locations for gamma ray bursts and then relay a 1-4 arc-minute position estimate to the ground within 15 seconds. After the initial burst detection, the spacecraft would "swiftly" (approximately 20 to 75 seconds) and autonomously repoint itself to bring the burst location within the field of view of the sensitive narrow-field X-ray and UV/optical telescopes to observe afterglow. Swift would provide red shifts for the bursts and multi-wavelength light curves for the duration of the afterglow. Swift measurements would be of great interest to the astronomical community and all data products would be available to the public via the internet as soon as they were processed. The Swift mission would represent the most comprehensive study of GRB afterglow to date. Swift was part of NASA's medium explorer (MIDEX) program. The hardware was developed by an international team from the United States, the United Kingdom, and Italy, with additional scientific involvement in France, Japan, Germany, Denmark, Spain, and South Africa. The Swift telescope payload was comprised of three instruments which worked in tandem to provide rapid identification and multiwavelength follow-up of Gamma-ray bursts (GRBs) and their afterglows. Within 20 to 75 seconds of a detected GRB, the telescope would slew autonomously so that the fields-of-view of the pointed instruments overlap the location of the burst. The afterglows would be monitored over their durations, and the data rapidly disseminated to the public. With its large field-of-view (2 steradians) and high sensitivity, the BAT would detect about 150 GRBs per year, and compute burst positions onboard the satellite with arc-minute positional accuracy. The BAT was produced by the Laboratory for High Energy Astrophysics (LHEA) at NASA's Goddard Space Flight Center (GSFC) with science flight software developed by Los Alamos National Laboratory. The XRT was built with existing hardware from JET-X. The XRT would take images and be able to obtain spectra of GRB afterglows during pointed follow-up observations. The images would be used for higher accuracy position localizations, while the spectra would be used to determine red shifts from X-ray absorption lines. The XRT was a joint product of Pennsylvania State University, the Brera Astronomical Observatory (OAB), and the University of Leicester. The UVOT was essentially a copy of the XMM Optical Monitor (OM). The UVOT would take images and obtain spectra (via a grism filter) of GRB afterglows during pointed follow-up observations. The images would be used for 0.3 - 2.5 arc-second position localizations, while the spectra would be used to determine red shifts and Lyman-alpha cut-offs. The UVOT was a joint product of Pennsylvania State University, and the Mullard Space Science Laboratory (MSSL). The Swift Gamma Ray Burst Explorer is a three-telescope space observatory for studying gamma ray bursts (GRBs) and monitoring the afterglow in X-ray, and UV/Visible light at the location of a burst. The burst detection rate is 100 per year, with a sensitivity ~3 times fainter than the BATSE detector aboard the Compton Gamma-Ray Observatory. The Swift mission was launched with a nominal on-orbit lifetime of two years. Swift is a NASA Midex (medium-class Explorer) mission. It was the third to be launched, following IMAGE and WMAP. Family: Astronomy, Gamma ray astronomy satellite. Country: USA. Launch Vehicles: Thor, Delta, Delta 7320-10C. Launch Sites: Cape Canaveral, Cape Canaveral LC17A. Agency: NASA. Bibliography: 2, 4131, 4132, 4133, 4134, 6962, 13243. 2004 November 20 - . 17:16 GMT - . Launch Site: Cape Canaveral. Launch Complex: Cape Canaveral LC17A. Launch Pad: SLC17A. LV Family: Thor. Launch Vehicle: Delta 7320-10C. Swift - . Payload: SA-200LL. Mass: 1,331 kg (2,934 lb). Nation: USA. Agency: NASA. Manufacturer: Gilbert. Class: Astronomy. Type: Gamma ray astronomy satellite. Spacecraft Bus: SA-200. Spacecraft: Swift. USAF Sat Cat: 28485 . COSPAR: 2004-047A. Apogee: 604 km (375 mi). Perigee: 584 km (362 mi). Inclination: 20.60 deg. Period: 96.60 min. NASA Medium-class Explorer satellite dedicated to study of gamma ray bursts, the third after the IMAGE and WMAP satellites. Delayed from December 5 and 29, 2003, January 14, April 29, July 15, September 1, October 7 and 26, November 8, 11, 17, 18 and 19..